Radiodetection RD400PXL with RD400HPTX Buried Pipe & Cable Locator. Includes 4" inductive Clamp. 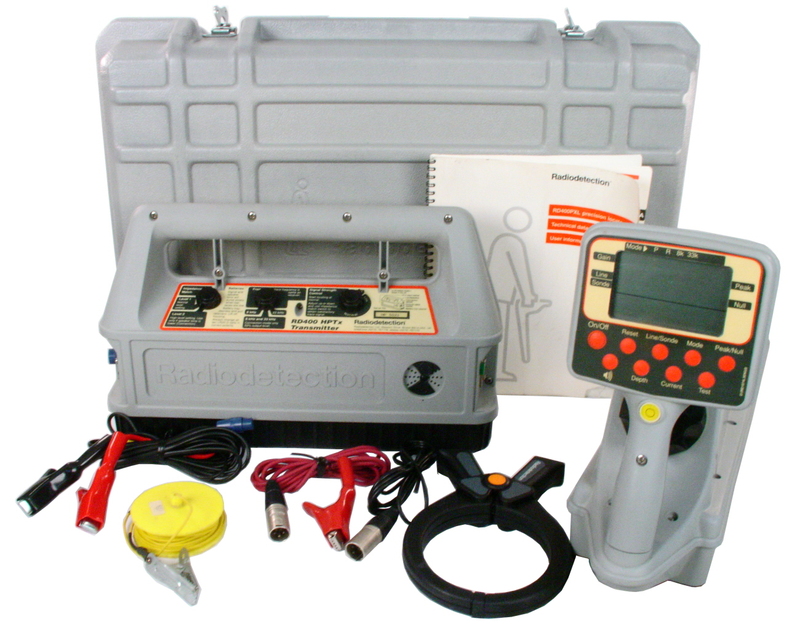 Radiodetection RD400PXL Precision Buried Pipe & Cable Locator with RD400HPTX High Power Transmitter. Operates at 33 kHz and 8 KHz plus Power, RF, and current modes. Includes 4" inductive Clamp. The RD400PXL is a Precision Locator comprising a receiver and a transmitter for pinpointing buried utility lines in congested and complex situations in the highway or on an industrial site. The receiver has a microprocessor driven display that provides more information about buried lines than has previously been available. The locator is designed for use by utility and telecom technicians needing to obtain as much information as possible about their buried plant. It is also suitable for users who like the convenience of automatic gain adjustment with a manual override and who prefer having a digital liquid crystal rather than a moving needle display. The digital microprocessor controlled receiver has a simple and clear liquid crystal display. The display gives digital and meter indication of response when a signal is detected. The display also indicates the gain in dB required to obtain the response. The display indicates responses, modes, battery state and depth measurement in either metres/centirnetres or feet/ inches and mA current value. The receiver indicates the amount of current on the target line in mA. The user can therefore distinguish a deep target line from a shallow line to which the signal may have coupled and which may give a stronger response. This important feature can also be used to monitor current on the line or to register current loss along the length of a line. The identity of a line in a congested area can be verified using Current Measurement. The line with the strongest current is the target line to which the transmitter signal has been applied. The Current Measurement'feature can be used to monitor insulation or coating condition on a buried cable or pipe. Monitoring surveys carried out at regular intervals and at convenient points along a line can establish if there is any deterioration of the line's protection.